Senate Majority Leader Mitch McConnell cancelled the August recess, requiring senators to stay in Washington for the summer. McConnell cited the backlog of executive nominees for the decision. 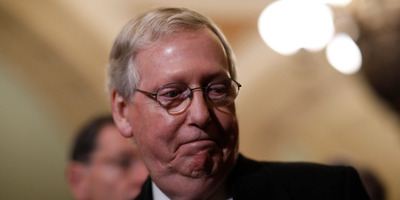 WASHINGTON – Senate Majority Leader Mitch McConnell informed colleagues on Tuesday that the August recess, during which lawmakers return to their home states for constituent work and campaigning, will not be a full five weeks this year. McConnell made good on the annual threat to keep the Senate in session for August, but also allowing senators to return to their states for just one week earlier in the month. The Kentucky Republican said that Democrats’ slow-rolling executive nominees was the catalyst for cancelling recess and that the extended time in session will be spent working on confirmations and appropriations bills. The move will do more than cancel vacations for a hefty number of Senate staffers; it will effectively prevent vulnerable Democrats in red states, of which there are several, from hitting the campaign trail while their challengers have free roam across their respective states. But Democrats played coy with the way a cancelled recess would effect their ability to campaign, instead welcoming the news with an eagerness to stay busy. Senate Minority Leader Chuck Schumer told reporters working during August is a “wonderful great opportunity” and that Democrats will pressure Republicans to focus on health care throughout the summer, but described McConnell’s decision as deceptive. Schumer also said that Trump should stay in Washington during August. But Trump will likely hit the campaign trail on behalf of several candidates challenging red state Democrats. He is easily one of the most powerful resources at rallies and events, which he has shown a large appetite for in the past.